Double the socks for everyone! I have gotten a slew of sock orders on my etsy, and in an effort to speed up the hand-knit process (not really a lot of ways to do that!) I decided to figure out knitting two at a time once and for all. I love using double-pointed needles in knitting socks because it feels much faster to me than constantly sliding everything around on the cord between the two needles on circulars. However, if there are two socks on there, the sliding is not quite as tedious, and it means you get each pair done and ready to block more quickly. I know it doesn't seem like you should be able to, since you're still knitting the same number of stitches, and it may be all mental, but since these are orders for basic socks, sometimes it's all about the mental game! I'm using my old stand-by basic sock pattern, which is the beauty of the magic loop; you can adapt any pattern to it. In order to not get such a pointy toe, I have my own little formula that's worked out pretty well, but that's the only change I've made. So here I am, heel turned, gusset picked up and ready to decrease. Let's hope these bad boys are ready to get in the mail by tomorrow night, which is my self-imposed deadline. After re-ordering them on the needles to match Knitting Giraffe's tutorial-much better! Next up: Another entrelac scarf, but a thinner version; stay tuned! 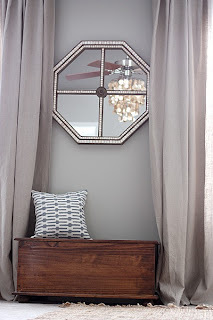 I was perusing DIY blogs (shocking, I know) after talking with my friend about options for a capiz chandelier in the bedroom without forfeiting our ceiling fan, and she pointed me to House*Tweaking for the awesome mash-up; The Fandelier. Her ceiling fan looks almost identical to mine, so I knew it would be a great fit. I'm so excited! Our King bed arrived, and it's been la-la-la lovely to get a great night's sleep with, or without (but mostly with from about 3am on), three other people in my sleeping space. We settled on the Englander Nature's Finest Organic Natural Latex mattress. J and I have both found it very comfortable, though it's been just a week; it's pretty darn cozy. It needs to be spun (head to foot) weekly for the first three months, and then about once a month after that. I had read some reviews that there were 'deep body impressions', but I think it could be because they didn't ever rotate the mattress. Either way, it has a lifetime warranty, and if there are body impressions after 6 months, we get a brand new mattress. 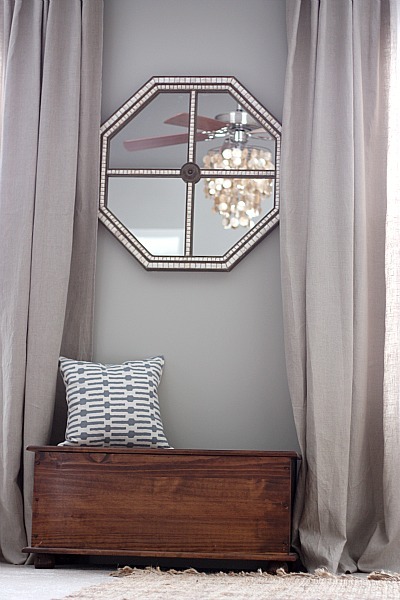 My point to detailing this cozy love nest is that, with the advent of late Fall/early Winter, we put our down comforter back on which served to reinforce that we use our ceiling fan year round. 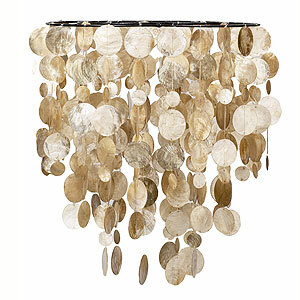 I had first had my heart set on this capiz chandelier from West Elm and with 20% off lighting, I thought I had it in the bag! Problem; it's a plug in, not hardwired, so I couldn't add it on to our fan. 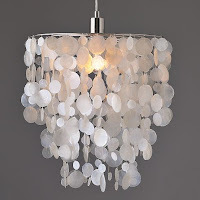 As I was talking to that same wise DIY friend about my sadness, she urged me to look at World Market's Capiz pendant, which does not include a light. But, how would that work? She asked me kindly, 'Doesn't your fan already have a light?' Oh my, is she a genius...or maybe I'm just slow. Luck be a lady, the World Market version was on sale for $52, instead of the $100 I was willing to spend on the sale-priced West Elm version, and the creams and browns will go better with my color scheme anyhow, since I've not had as much white as I first anticipated. 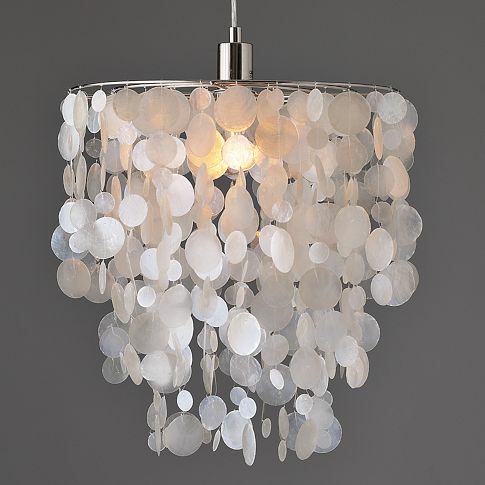 I just got the email confirmation that it's been shipped to me, so I'll post pictures when I swap out the glass bowl for the chandelier (and cross my fingers that the tinkling shells don't drive J bonkers in the night...I'm hoping it just makes him feel like he's at the beach!). I'm not sure what I was thinking with the other light, which just goes to show that I should always hire out electrical work!